- a comprehensive companion website providing valuable supporting material, study questions and a bank of primary sources. Lucid and engaging, this edition retains all the user-friendly features that have helped to make this book a favourite with both students and lecturers, including marginal glosses, illustrations and suggestions for further reading. Along with its companion website, this is an essential guide to the theory and practice of history. "This exceptionally insightful book makes the study of history a joy to read. Tosh maps out the major questions and developments in historiography with extraordinary clarity, guiding the reader on debates and methods of research in concise and informative ways. His continued attention to up-dating the book without doubt makes it a critical text for undergraduates and an essential resource for postgraduates and scholars." "John Tosh’s book is the most useful introduction to recent historiography now available. It surveys major trends and achievements more clearly and concisely than its main competitors, and is an excellent and easy resource for contextualising other historical writings of all kinds. It can add a great deal to students’ understanding of historical writing." "The Pursuit of History has many strengths. It is extremely well-written and lucid. It strikes a very nice balance between tracing historiography, delineating historical methodology, and discussing the major historiographical developments over the last few decades. Comprehensive, insightful and conversant with the latest historiographical currents, it is essential reading in any undergraduate or graduate theory and method course." "John Tosh's Pursuit of History was so far ahead of the game on its first publication that much of the profession are only just now catching up with his wonderfully diverse and pluralistic approach to the study of the past. This new edition promises to equip and inspire the next generations of historians once again very much for the better." 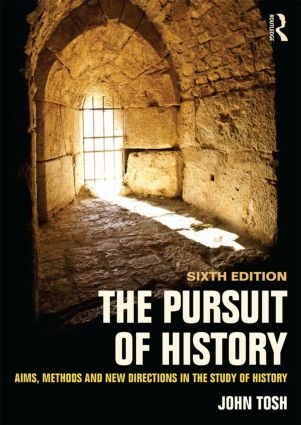 "Tosh’s Pursuit of History, in its newest edition, remains the definitive introduction to historical criticism and historiography. Well-structured, up-to-date, highly readable and drawing on a wealth of fascinating illustrative material from the author’s own research, it stands out as the best text combining fundamental method with key theoretical approaches and research trends." List of images. Preface to the Sixth Edition. Acknowledgements. 1. Historical awareness 2. The uses of history 3. Mapping the field 4. The raw materials 5. Using the sources 6. Writing and interpretation 7. The limits of historical knowledge 8. History and social theory 9. Cultural evidence and the cultural turn 10. Gender history and postcolonial history 11. Memory and the spoken word 12. History beyond academia. Conclusion. Index.